Within the lair of a tyrannical villain, a lavish song and dance ensues while we're watching a colossal shark swim in an enclosed tank. The war-torn streets of a city are tattered and littered with eviscerated toys and ash. And rat-humanoid soldiers soar through the air in jet-propelled gliders (think Santa Clause), while a helicopter with at least twelve propellers and a pair of mechanical legs zips along the horizon. No, you're not reading the wrong review: all this exists within The Nutcracker: The Untold Story, a UK-Hungary co-production directed by Andrey Konchalovskiy, and it's about as, uh, different as it sounds, showing inspiration from Julie Taymor and a little Sky Captain in its theatrical opulence. But it's also convoluted, out-of-place, and frustrating against the context of Christmas family fare -- and a wacky juxtaposition of holiday tidings and dystopian bleakness is only the start of its problems. Most of that occurs in the second half of this wild deviation from E.T.A. Hoffman's story, while the first feels a little more at-ease in the spirit of holiday-focused cinema. 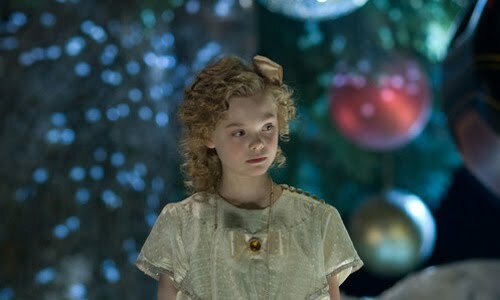 It tells the story of a wealthy family in '20s Austria, mostly from the perspective of Mary (a charming but discomfited Elle Fanning, Super 8), a pre-teen girl who wants her whole clan together for Christmas -- something that's not going to happen since her mother (Yuliya Vysotskaya), an opera singer, has a performance that evening. Instead, she and her brother will be looked after by their uncle, Albert (boisterously accented by Nathan Lane, The Producers), and after he brings over a dollhouse and a wooden nutcracker for the kids, he sings them to sleep with the 'Relativity Song" (yeah, he's that Albert). But in the confines of Mary's dreams, or so it seems, the wooden nutcracker becomes human-sized and speaks to her of important matters, while her home also shifts in dimension and the dollhouse her uncle gave her -- as well as the handful of toys/dolls occupying it -- comes to life. At first, for the most part, Konchalovskiy's odd holiday extravaganza treads water by spinning a bland but tolerable riff on the Nutcracker story, even though stilted performances, tonal shifts, and impromptu musical numbers still render it a perplexing and unfocused celebration of the story's tradition. A lot of it comes from its artistic perspective, easily the film's highlight; as the camera guides through a blown-up version of Mary's house, through the needles and branches of a Christmas tree adorned with candy-colored ornaments, and amidst whimsically-swirling magic sparkles, it surrounds the wide-eyed Mary with visual delights that, at first, distract from the tale's cockamamie hollowness. And even though the idea of familiar faces appearing in one's dreams has been explored- Tarsem's The Fall comes to mind -it fits well-enough here to not feel overly banal against its dreamy setting. But once we learn more about the nutcracker, his royal lineage, the spell that turned him wooden, and his kingdom being overrun by humanoid rats, this thing turns sour just as soon as it moves away from the dollhouse and Christmas tree. Transforming the rats into warmongering imperialists and erroneously removing itself from the Christmas atmosphere -- literally and tonally -- for nearly half the picture, the path it undergoes as Mary continues her travels with the animated Nutcracker (NC, as he's goofily called) becomes one of the most infuriating, poorly-conceptualized holiday films I've seen. Due in equal parts to ungainly direction from Andrey Konchalovskiy and dreadful scripting, the magical essence that spices up the beginning is lost in the smog of peculiar dreariness, created by an ugly Burgermeister-Meisterburger villain in Joe Turturro's rat king and a dreary air that wants to say something about war-torn cities ... but can't come close. Aside from the problematic filmmaking in its bones, The Nutcracker: The Untold Story faces its biggest problem in trying to both wildly deviate from the story proper and reincorporate the elements that hallmark a production of The Nutcracker -- including Tchaikovsky's score, now accompanied by hammy lyrics by Tim Rice. Instead, we're left with snarling Nazi rats with retractable snouts, sharks killed on a whim, and oodles of spirit-zapping oddness in the destitute streets of the smoky city in Mary's dreams, and the action or stakes that propel it through the deviations can't generate enough concern over the outcome to justify its peculiarity. So much has gone awry that it's tough to succinctly convey it, but saying there's no magic, too much fright, and not enough Christmas cheer is a good starting point, and whoever voiced this untold (albeit wall-to-wall identifiable) story and its tangents should've bit their tongue.